Mobile fire protection system for large properties such as ranches and estates, home owners associations and neighborhoods that want to share fire pre-treatment equipment and capabilities. Stand alone fire protection system with the capability of setting up and leaving a temporary fire protection system to protect your home or property. Can also be used for aggressive fire protection and suppression for those who want to stay and protect their property. The FOAMSAFE Mobile System is a rugged, completely self-contained trailer unit that allows you to enter a fire-threatened area, set-up and leave the area knowing you can help protect these areas without endangering lives . You can pretreat chosen areas before the fire comes, giving your structures and vegetation a better chance for survival through any wildfire threatening a community. The Mobile System comes with all you need to pretreat or protect your property. This Mobile System can be ordered as a complete wildfire fighting unit with all accessories needed, or custom order to your needs. Call today at 1-866-901-CFPI (2374) to speak with a specialist to help you choose your system. 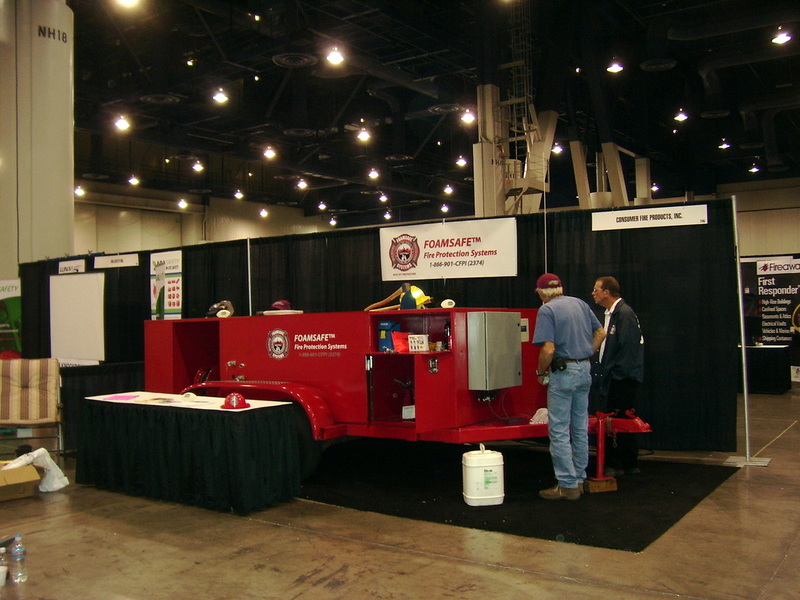 Firefighters - The FOAMSAFE™ Mobile System is a self-contained trailer system to handle your wildfire pre-treatment/suppression needs – Easy operation, one zone at a time. Call us today for more information on how we can help you keep your community safe. Originally designed for rapid attack in fire suppression, this 5-gallon powerhouse allows you to direct foam as a pretreatment method and on-demand during wildfires. The FOAMSAFE Bakpak is easy to maneuver and allows you to protect your property as needed. Fully self-contained CAFS (compressed air system) produces over 50 gallons of foam per fill up. Shoots foam over 40'. With a strong back you can cover some ground and pretreat or put out fires. Twice the power of the FOAMSAFE Bakpak, this workhorse on wheels will spray foam for up to 1-1/2 hours at approximately 100 psi. It can spray foam up to 75 feet and is easy to maneuver with hard case wheels and a sturdy frame. Its powerful internal pump system gives you a professional firefighting foam tool. Stores easy and compact when not in use. It's a perfect tool for pretreating before evacuation or putting out hot spots and small fires.